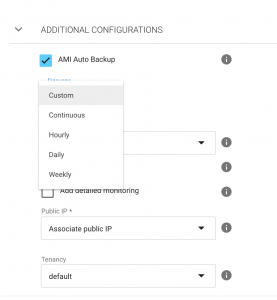 What is AMI Auto Backup? The AMI Auto Backup provides a continuously updated point-in-time backup for the Elastigroup. This feature creates an image from a running instance in the Elastigroup and updates the group with the newly created image. By default, Elastigroup stores the last 3 images taken by the AMI auto backup. During Spot replacements, Elastigroup recovers from the latest image automatically. Note: The coexistence of AMI Auto Backup and Data persistence (stateful) is not allowed. Continuous: The Continuous option will create a backup every 10 minutes. Custom: Use the Custom option and set a Cron expression to meet your needs. Hourly: Every hour a new image is created. Daily: Every day at 00:00 UTC, a new image is created. Weekly: Every Sunday at 00:00 UTC a new image is created. You’re all set! Elastigroup will now automatically create backup images.